The chamois, also known as shammy, black goat in Romanian, belongs to the family of Bovidae, subfamily of Caprinae and is named Rupicapra rupicapra in Latin. It can reach 0.8 meters at withers, 1.3 meters of lenght and 60 kilograms. The chamois lives in the high mountains of Europe, in Romania being found in Retezat, Făgăraş, Parîng and Bucegi between Walachia and Transylvania. In the fifties just 1.500 heads were left in Romania, but ever after their number kept increasing and increasing to a fair sum. Beside its straight horns having the tips bent backward, the hunters are also keeping as trophy the chamois's mane. The mane starts on the forehead and goes all the way to the tail. Disappeared from the Oriental Carpathian Mountains, it was recently colonized in Rodna's Mountains of Maramureş (Transylvania), especially in the Pietrosu Reserve that stretches over more than 3.300 hectares around the Pietrosu Peak (highest in the Oriental Carpathians, 2.303 m). At the time the preserving efforts are directed in reintroducing the chamois in the Ceahlău Reserve in Moldavia - worth noticing is that the chamois is and was the main charge on the Moldavian county of Neamţ coat of arms despite its extinction in the region. The chamois photos above were taken in 2004, in the Bucegi Mountains, on the Jepii Mici (Small Dwarf Mountain Pines) Valley. The chamois photos above were taken in september 2005, near Toaca Peak in Ceahlău Mountains. The golden eagle is to be found in the mountainous districts of the Northern Hemisphere. It belongs to the order Falconiformes, family of Accipitridae = Aquilidae, being scientifically named Aquila chrysaëtos; it reaches 1 meter from the tip of the bill to the tip of the tail and has a wingspan of up and even over 2 meters. The common lynx, i.e. the Eurasian lynx is closely related to its North American cousin, the bobcat. It belongs to the order of Fissipeda, family of Felidae and is scientifically called Lynx lynx. Nocturnal and solitary animal, it reaches 1.5 meters in lenght (of which the tail spans around 25 centimeters), 85 centimeters in height and weighs up to 45 kilograms. In the eigthies only 1.500 heads were left in Romania, the hunt being allowed only under direct supervision of the Silviculture Ministry at the time. The first nature preservation law was passed in Romania in 1930. In 1933 the "Comission for Preserving Nature's Monuments" was established, which the same year declared as protected and monuments of nature several animals, among which species of vultures, eagles, pelicans, the large egret, the small egret, the raven and the lynx. Emil Racoviţă was member of this comission and Romanian numismatics remembered him also on an anniversary coin. The National Park Retezat dates back from 1935. Today it stretches on over 16.000 hectares, 1.600 from which enjoying integral protection. 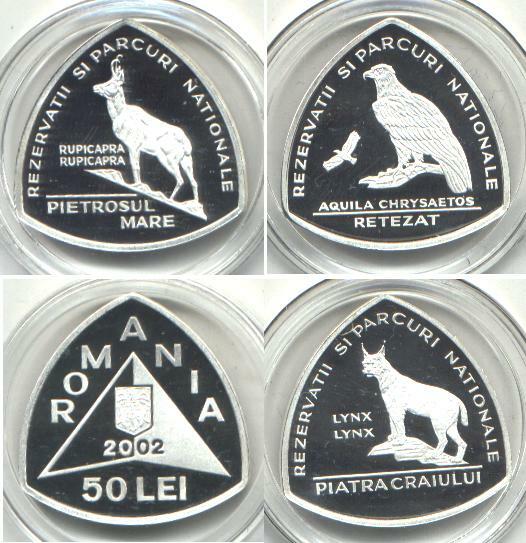 The silver anniversary coins pictures above are present on Romanian coins through the kind permission of Mr. Adrian Popovici.